Quick snack idea that is tasty and satisfying before we get on to weightier topics :)…. 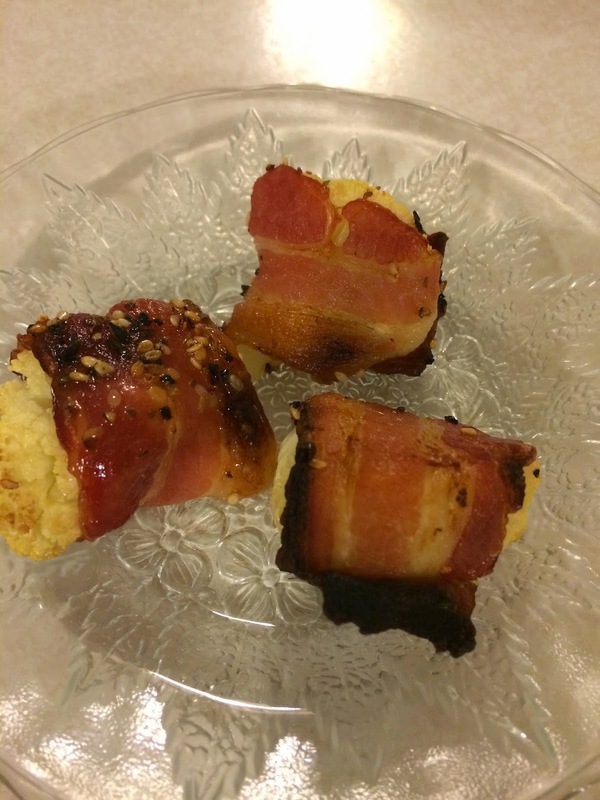 Wrap bacon around cauliflower…season with favorite seasoning….put into oven on broil at 400/425….I check about every 5 minutes til one side is brown then flip! Yummy, fun, and sooo satisfying! I’m not a scale kind of gal. I know the scale doesn’t tell me what I want to know about my health, especially not for my mind, body, and soul! Too many people get caught up on the scale, especially women. The scale becomes a tool of reward or punishment. A woman steps on it and hears, “ugh you’re not sub-zero yet?”, or “Oh, your creeping back up in numbers” Forget the fact that you may be having of inflammation going on from PMS or weightlifting. Further, the scale encourages irrationality. This year I have only stepped on the scale a handful of times mostly to have a loose idea of some of my strength goals and how it may relate to the scale. Thus, here are some fascinating facts for everyone to put the scale into perspective…..and hopefully convince all women to throw the darn thing away! Two years ago because of over training, work, etc, I weighed ten pounds less. During the first year I worked on rebuilding my bone density, and muscle tone. Then this last year I took the challenge of putting on muscle without bulk and without changing my pants size. The result….I gained ten pounds of amazing muscle. I still fit into my same cloths, maybe a bit curvier and fuller but definitely stronger, firmer and more WOMAN!!! And the best thing of it is that my body fat percentage is actually less. Here is another tidbit…..twelve years ago before I was pregnant with my daughter I was right about this same weight on the scale BUT two to three sizes larger. Both situations show the difference of really dialing in a person’s nutrition and doing focused strength training to accomplish a specific goal. Do my genetics play a factor into weightlifting and building muscle? Probably. I don’t think I put on muscle exceptionally easy but I think I have it easier than some. What the last two years has taught me is to love every challenge we give ourselves: mentally, physically, and spiritually. A person must understand every challenge requires work and effort. Once a person has obtained their goal doesn’t mean we can’t reflect and decide if we want to continue on this path, choose a different route/goal, or even go back to the place you started. That is the beauty of growth through challenges. Life is a beautiful journey that we MUST keep challenging ourselves: MIND, BODY, AND SOUL! What challenge are you going to give yourself for 2015? Share with me your biggest challenges, goals, desires for mind…body….soul for 2015!!! PS….next posting you can read about the ups and downs I have experienced with putting on 10 pounds, even with it being muscle. Mind Body and Soul of 10 pounds!